Isn't this AMAZING? When I saw the super eggplant that Jessica's genius husband drew...I "wondered" if perhaps he could do a DG mascot....and the next morning, THIS arrived in my email inbox. WOWZERS. I LOVE this gal! Awesome!! Love it! 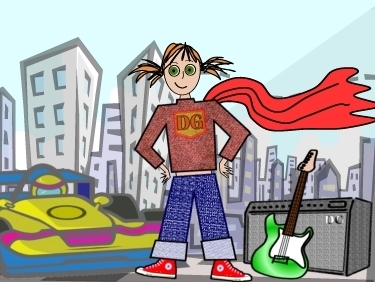 Watch out, world, danger girl is coming! She has a certain je ne sais quoi....around the eyes, I think.